Good morning. It’s the last day of September, and if I lived in a temperate area, I would be anticipating the arrival of autumn’s cool weather and colorful leaves. Alas, I live in Dar es Salaam, where it’s hot, and the arrival of October just means it’s getting hotter. At least the rising heat in Dar is a result of normal seasonal fluctuations caused by Earth’s tilted axis of rotation. That may not be the case for much of Europe and North America, according to a new study from Rutgers University, USA. Jennifer Francis claims that the ‘extreme’ weather events, which are becoming more and more common in North America, are tied to changes in Arctic sea ice levels. 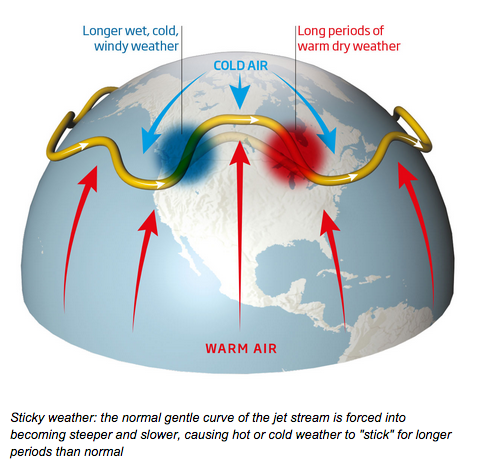 Crazy weather and the jet stream. Image: screen capture from New Scientist. I was searching through Graphite.org again over the weekend, and this list of top picks for science apps has been sitting open on my browser since then. I haven’t had a chance to explore these apps in depth, but there seem to be some pretty good ones in this list. And last but not least, the obligatory astronomy plug: Jupiter’s moon Europa, one of the best candidates for finding life elsewhere in our solar system, is covered by a thick layer of ice that moves around in much the same way that tectonic plates shift on the surface of our home planet. Good morning! Well, it’s Monday, so how about just a “morning” until my coffee kicks in? Speaking of coffee, ASAP Science released the video below over the weekend. It’s not particularly relevant to anything we’re studying right now, but it is educational and scientific. And now for the less good news: Global warming is likely to continue unabated, at least for the foreseeable future of our lifetimes. Researchers have published papers in Nature Climate Change and Geophysical Research Letters claiming that natural variations in planetary warming are being overwhelmed by human-induced carbon emissions. Prepare for more extreme weather events for the next 100 years or so! Some good news now: Nature magazine reports that a new test for malaria, if proven effective in the field, could bring testing and treatment to millions of rural people who currently don’t have access to these potentially-lifesaving interventions. Science at its best – improving the world around us! Why Should We Trust Scientists? As a poor, coastal, urban community in Sub-Saharan Africa, Dar fits this description perfectly. Jim Yong Kim, President of the World Bank Group, talks about the perils of climate change in the brief video embedded below.